If globalization has taught us anything, it is that location matters. Easy access to capital, suppliers, logistics, skilled labor and innovation has become essential criteria in choosing where to locate a company’s operations. 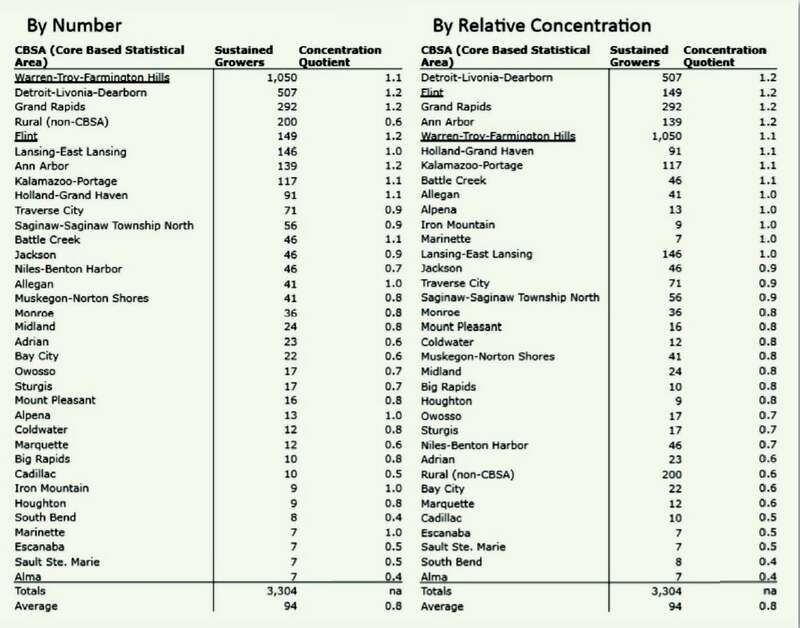 The Michigan Growth Census, prepared by Build/Inc., found that two-thirds of the state’s sustained growers—companies with net job growth in the past five years—are located in five metropolitan areas (see “Hometowns with an Advantage” below). But that’s not the whole story. These exceptional companies are found in every urban area across Michigan, as well as small towns and rural areas. Two-thirds of all sustained growers are located in just five regions. However, they are also found in every urban area across Michigan. ere are also 200 of these exceptional companies located in small towns and rural areas. “We’re seeing success all around the state, but we don’t want to rest on our laurels,” says Steve Arwood, president and CEO of the Michigan Economic Development Corporation (MEDC), a public-private partnership dedicated to business and job growth. “We’re continuing to provide support with innovative programs to help businesses get the support they need.” Primary among these is the Michigan Business Development Program (MBDP), which provides grants, loans and other economic assistance to businesses that create jobs and provide private investment. MBDP success stories include Newell Rubbermaid, which recently relocated its design functions to Kalamazoo, and Rassini Brakes, which is reshoring production from Mexico with a new facility in Flint. While sustained-growth companies are found throughout the state, a few metropolitan areas stand out with not only the highest number of sustained growers, but also the greatest concentration of such companies as related to the average. These include Detroit and its northern and western suburbs, Troy and Farmington Hills, which are benefiting from the dramatic automotive turnaround and a coordinated strategy to integrate manufacturers, suppliers and the R&D community; nearby Ann Arbor, home to the state’s venture capital community and the University of Michigan; and Grand Rapids, recently ranked by Forbes as the best U.S. city to raise a family. Michigan’s 15 SmartZones provide distinct geographical locations where technology-based firms, entrepreneurs and researchers can tap expertise and create collaborations with universities, industry, research organizations, government and other institutions, as well as tech business accelerators. Another innovative MEDC program, Redevelopment-Ready Communities, promotes effective redevelopment strategies statewide through a set of best practices that integrate transparency, predictability and efficiency. These communities—cities such as Allegan and Roseville—have shown that they have a vision for the future and the fundamental practices in place to get there. To learn more about how the MEDC helps small and mid-sized companies grow and thrive, check out all the available resources at the Pure Michigan site, www.michiganbusiness.org. or call 888-522-0103.